Remember when Lunchables first came out and you begged (I mean, begged) your mom to get you one. But then after all the hype it just wasn’t as good as you were hoping? Yeah, me too. That’s why I refuse to buy them for my kids. They’ll thank me for it later, I’m sure. Nothing could be easier than this Menu #5 from our Lunch Menu Series. The best part is that it is also one of my kids’ favorite lunches. I have one who will spread cheese on the crackers and layer with lunch meat. And one who eats everything separately, and yet another who creates her own cracker sandwiches. It gives them the chance to be a little creative here. You can totally sub whatever cheese, meat, crackers, and fruit your kids like best. It’s just a nice reminder that sometimes nothing tastes better for lunch than good old crackers and cheese. 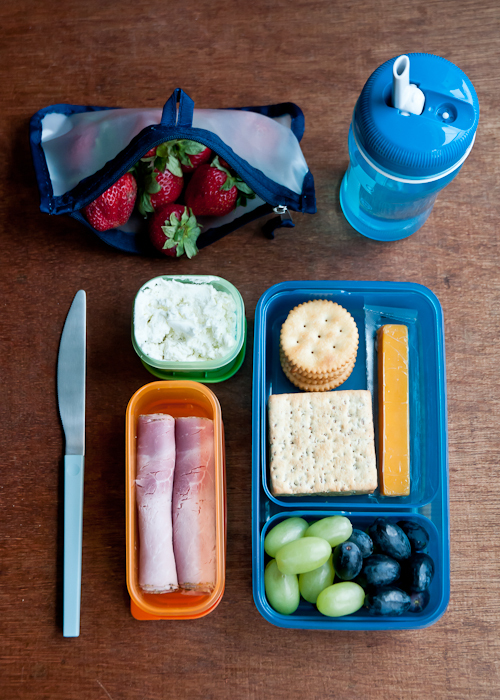 – For younger kids, skip the spreadable cheese and knife and use sliced or cubed cheese instead. I’m loving the Lunch Box series! My oldest is in first grade, so we’re only two months in to sending lunch every day. So far I’ve been sending a lot of leftovers in her small Thermos. We also use a lot of reusable bags and containers, so I’m hoping for a post that reviews the different products you’ve used. Specifically, those Blue Avocado zippered bags. I haven’t yet found a reusable bag that I feel like I can put a sandwich in. Most are too small for the bread we use, and none of them are airtight, so the bread ends up drying out before lunchtime. Are the B.A. pouches different? I love homemade lunchables! I stick toothpicks into the rolled up lunchmeat, then cut them into sections so they are “fancy.” Neither of my kids are in school yet, but it makes an easy stick-in-the-fridge lunch for taking to the park or to throw on the table after a busy, errand-filled morning. Even more than the menus, I’m loving all these containers, reusable bags, and lunchboxes! This is one my kids’ favorite…I usually make it with higher quality pepperoni and cheese. I wish you were my mom! I just checked out all 5 of these posts…man, I’ve been cheating my kids. I can’t wait to try them for my boys and even for me and my little one at home. Can’t wait for more post like this. When you are stuck in the every routine you often dont think how simple it is to get some new combinations to your kids. Love love love. I’m totally in a lunch rut. Do you have any sources for the containers? Whoops! Sorry. Missed it first time through. I do this at least once a week for my kids & they love it (ages 5 & 8). They refer to it as their “snack lunch”. I usually send in a small container of Greek yogurt in the Blox containers, too so they have some added protein.. Those are my favorite lunch containers. The kids say they always get “That’s so cool” comments when they have their snack lunch.